This hanging chalkboard combines contemporary home decor with functionality. The outer dimensions measure 31.5 inches across and 22 inches high with a depth of 2.75 inches. The decorative chalkboard can be used write your important reminders or positive notes to start off your day! the board also has two metal hooks so your days of searching for your keys are over! the hooks are sturdy enough for full Key chains or other odds and ends that you would like to hang. Also included are five metal baskets to store your important mail, bills, or other odds and ends off of the top of your counter. The baskets each have a metal label pocket which you can label "outgoing mail," or customize however you would like. This functional chalkboard has two saw tooth hangers on the back for easy display. 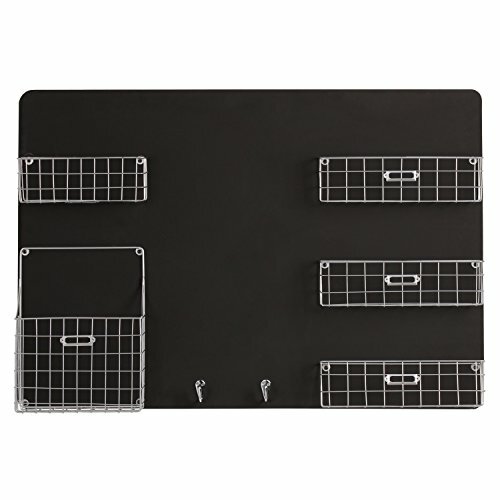 This multi-functional wall hanging chalkboard is the perfect tool to bring order to your office, kitchen, or entryway. Two pre-attached saw tooth hangers included on back for wall display; item is ready for hanging!